ARLINGTON—Tuesday, Mansfield Timberview Class of 2013 standout Lili “Champ” Thompson, will visit her former school to inspire students. She will be joined by her new Harlem Globetrotters’ teammate Zeus McClurkin. 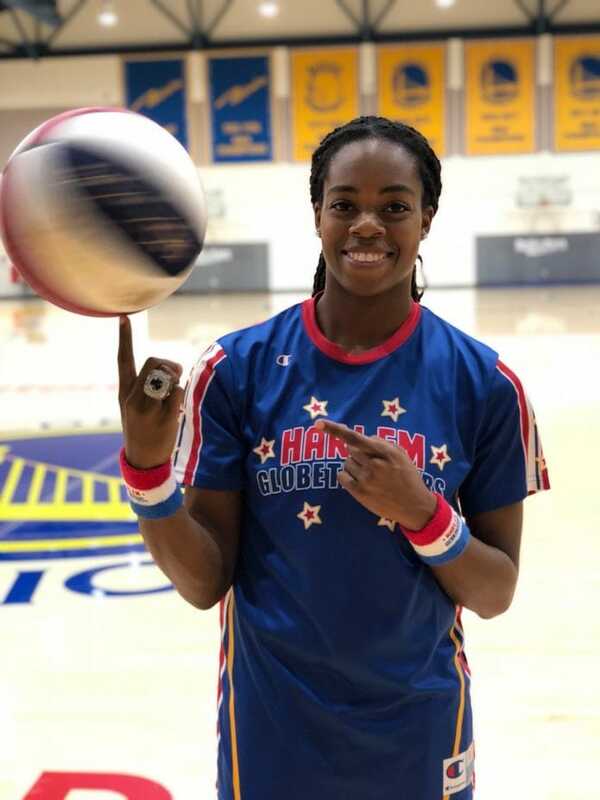 Thompson will tell her story of how she went from a Timberview High student to a National Champion with an undergraduate degree from Stanford University, a master’s degree from Notre Dame, and now plays for the world famous Globetrotters. The current Timberview girls’ basketball team, one of the highest ranked in the state, is scheduled to join the assembly with nearly 200 additional students. Thompson had a standout college career at both Notre Dame, where she was part of the national championship team. At Stanford, she helped lead her team to the Final Four in 2014. As a Cardinal, she was a three -year starter and earned All-Pac-12, Pac-12 All Defensive Honorable Mention, Pac-12 All-Academic Honorable Mention, and became a two-time ESPN National Player of the Week. Thompson is the daughter of two parents who served in the U.S. Army. 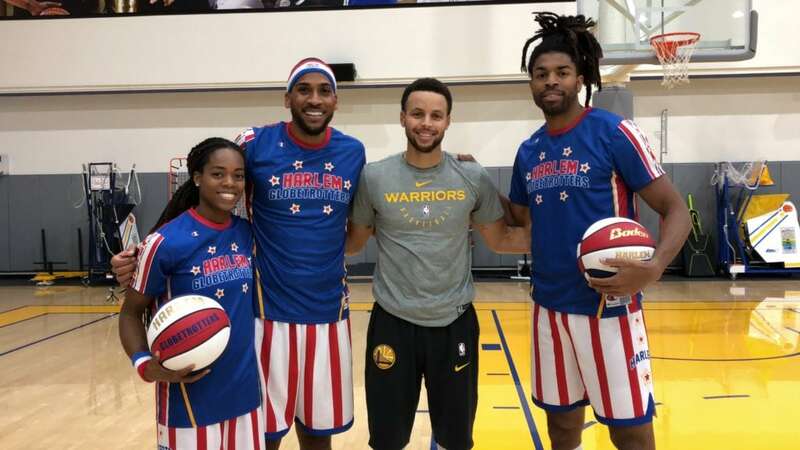 November 1 Steph Curry joins the Globetrotters practice session. She is joined her teammates Zeus McClurkin (left) and Hammer Harrison (right). The Harlem Globetrotters are legendary worldwide, synonymous with one-of-a-kind family entertainment and great basketball skills for the past 92 years. Throughout their history, the Original Harlem Globetrotters have showcased their iconic talents in 123 countries and territories on six continents, often breaking down cultural and societal barriers while providing fans with their first-ever basketball experience. During Thompson’s first week on the job, she joined teammates Zeus and Hammer Harrison in a collaboration with Steph Curry at a Warriors practice on Nov. 1. The Globetrotters will bring their Fan Powered World Tour to Dallas and Frisco over Thanksgiving Weekend with games at Dr Pepper Arena on Friday, Nov. 23 at 2 p.m. and 7 p.m. In addition there will be two more games at American Airlines Center on Saturday, Nov. 24 a 1 p.m. and Sunday, Nov. 25 at 2 p.m. The full schedule of the Globetrotters’ games in Texas and around the world are available at www.HarlemGlobetrotters.com. Thompson is one of two top female players joining the roster this year, along with 5-8 guard standout Brittany “Ice” Hrynko. Hrynko, who was born and raised in Philadelphia, played professionally in Israel, Italy, Germany and Slovakia where she led the Slovakian Golden Angels to a league championship in 2016. Before going overseas she was selected in the second round (19th overall) of the 2015 WNBA Draft, going on to play for the San Antonio Stars and the Tulsa Shock, after earning Big East Player of the Year and Big East Scholar-Athlete of the Year as a senior at DePaul. At just 4-6, Justin “X-Over” Thompkins will become the second-shortest player in Globetrotter history; the shortest is his 4-5 older brother and current Globetrotter Hot Shot Swanson. Hailing out of New York, X-over is renowned for his ability to handle the basketball, and was showcased with several streetball exhibition teams before joining the Globetrotters.